The STAP papers on making iPS like cells using acid treatment of differentiated cells really has people talking. 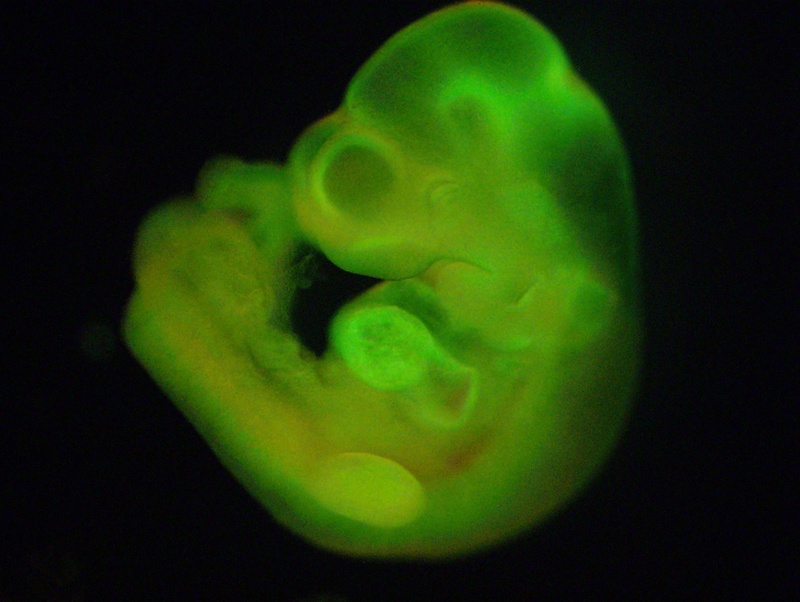 See embryo at right made from GFP reporter STAP cells that glow green. As I said in my review of the papers yesterday, there are still some critical things we do not know about STAP cells and I posed 6 key questions that remain open so we cannot really predict their impact quite yet or the impact of this technology. I will, however, make a few predictions and through some additional thoughts out there based on this development. We will see a wave of papers in the next 6-12 months with various researchers reporting that they have done all kinds of very harsh things to cells and by doing so they made them into stem cells. If this technology is reproducible and works in human cells, it also has potential for cancer treatments as well. Would this be based on low pH reprogramming of cancer cells? I’m not so sure because notably cancer cells are already acidic and create an acidic microenvironment. Could that contribute to cancer plasticity? It’s also possible that the controversial, elusive VSELs and MUSE cells might have some connection to stress-related reprogramming or induced plasticity in vivo. It is in addition a concern that almost killing cells with stress, even if they turn into the STAP stem cells, might leave some residual damage in the STAP cells that manifests later. Even though the karyotypes of the STAP cells were reported as normal, I wonder if smaller, but still significant damage either in the nucleus or elsewhere in the cells could manifest later on with deeper analysis. The bottom line is this remains a fascinating development that has raised both some skepticism and also lots of excitement in the stem cell community. What Vacanti have shown is induced totipotent cells or induced VSELs: iVSELS. VSELs are published to be cd45-. Vacanti isolated cd45+ cells and show that their reprogramming method results in CD45- cells, which are oct4 positive. and around 5uM in diameter, little cytoplasm and a big ol nucleus. All the characteristics of VSELs. Right now, many around this blue marble are soaking their cells in HBSS at ph.5.7 for 30 minutes. VSELs, when thought about deeply, are the only logical solution for a body to take care of wear and tear. As much as I like playing with iPS and stem cells, and as much as the research into these cells has taught us a lot, ultimately they don´t seem so attractive when you think about physiological and evolutionary realities. If VSELs are finally found to be a reality, and they are what their supporters say they are, then iPS and stem cells are useless for regenerative medicine. Almost no one will think about, until reading this perhaps, that a proliferating VSEL in culture is mother natures biggest artefact. I wasn’t aware that cancer cells or environments are acidic- could you kindly show me a reference? The first google hit didnt promise much: http://www.ncbi.nlm.nih.gov/pmc/articles/PMC1977628/pdf/brjcancer00073-0015.pdf. Do you think cancer cells get close to a pH of 5.7, since 75% of those blood cells die from it in 30 minutes? Thanks! Go back to O. Warburg papers on cancer metabolism.